WARNING: This product can expose you to chemicals, including di(2-ethylhexyl)phthalate (DEHP), which are known to the State of California to cause cancer and birth defects or other reproductive harm. For more information go to www.P65Warnings.ca.gov. 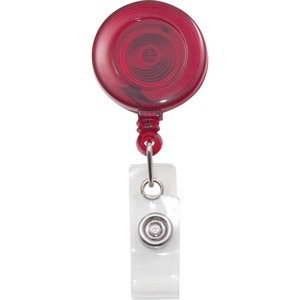 Let your ID card stand out with these distinct, translucent, Retractable ID Card Reels with Snaps. Each reel has a sturdy, built-in, belt/pocket clip and a clear badge snap that easily connects to your employee or other identification cards (holders sold separately). The retractable cord extends up to 30"" to allow convenient scanning and swiping of cards. It retracts easily for convenient wearing. ID card reel are an excellent choice for small or large office use. California Proposition 65 Warning WARNING: This product can expose you to chemicals, including di(2-ethylhexyl)phthalate (DEHP), which are known to the State of California to cause cancer and birth defects or other reproductive harm. For more information go to www.P65Warnings.ca.gov.